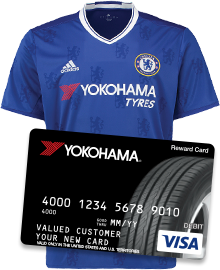 BUY A SET OF FOUR OF THE BELOW YOKOHAMA TIRES AND YOU'LL BE ELIGIBLE TO RECEIVE A YOKOHAMA VISA PREPAID CARD, UP TO $80, OR CHELSEA FC 2016/17 JERSEY! *Jersey offer includes a choice between size large or X-large. Redemption period ends June 30th, 2017. For online redemptions, click the link below and follow the instructions. You must submit your claim by 11:59 PM Pacific Daylight Time on 06/30/17. Please download the form at the link below. Complete it and attach your original receipt and mail it to the address listed on the form. Your claim must be postmarked by 06/30/17. To check the status of your Yokohama VISA® prepaid card or Chelsea FC jersey, please visit yokohamatirerebates.com or call (877) 773-7723. 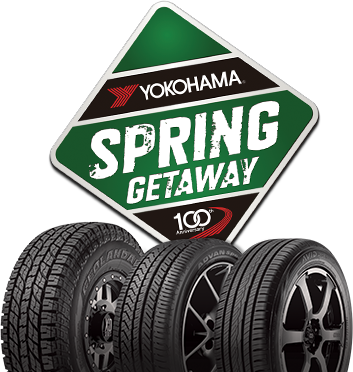 Valid for purchases made April 15–May 31, 2017 of a set of four Yokohama ADVAN Sport A/S, AVID Ascend, AVID ENVigor, AVID ENVigor ZPS, GEOLANDAR G055, GEOLANDAR H/T G056, GEOLANDAR A/T-S, GEOLANDAR A/T G015, GEOLANDAR M/T+, ADVAN Neova AD08R, ADVAN A048, ADVAN A052, Tornante*, YK740 GTX* or YK-HTX* tires at participating locations or at Yokohama-authorized online dealers. Allow 6–8 weeks for delivery of prepaid card or jersey. *Available at select retail locations. 1. Visa prepaid card or Chelsea FC jersey redemptions per household, customer or email address. Purchase must be four tires for a single vehicle. The required invoice for a second redemption per household, customer or email address must show purchase of an additional set of 4 tires for a different vehicle than the one referenced in the first redemption. 2. Chelsea FC jersey redemptions are available while supplies last. 3. Late submissions will not be accepted. 4. Claims of lost materials will not be honored unless accompanied by proof of receipt of materials by sponsor, such as proof of certified mailing. 5. Sponsor reserves the right, in its sole discretion, to withdraw or amend this offer in any way or to amend these terms and conditions without prior notice or obligation. 6. Offer valid only for legal US residents physically residing in the 50 United States (includes DC). 7. Offer valid only for purchases made at participating retail stores and at authorized online Yokohama dealers. Purchases at non-authorized online dealers are not eligible. 8. This offer is not valid for commercial, fleet or employee purchases. 9. This offer is not valid with any other Yokohama offer, except for rebates under the Friends & Family or Partner Perks Programs. 10. Void where prohibited by law. 11. Reward paid via a Yokohama Visa prepaid card in US dollars. The card is issued by the Bancorp Bank, Member FDIC, pursuant to a license from Visa U.S.A. Inc. Please pay attention to the expiration of your card.